April Fool or Just a Fool? My intent was to wait until I had successfully raised the two American Guinea Hogs to butcher weight before obtaining more hogs. However, the gentleman I obtained Hamlock and Ham-let from is making plans to leave the state and is selling off his remaining hogs. 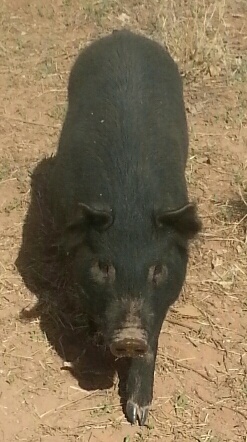 I have not found anyone in New Mexico with registered AGH and almost everyone I located with AGH are crossing their hogs with Ossawa Island Hogs. This meant that if I wanted AGH I was going to need to either go out of state or buy more from my original source before he sold everything off. After giving it some thought, I decided to go ahead and buy more hogs now. So Quibeyn Farm is now home to three additional American Guinea Hogs – two young gilts (unbred females) and a very young boar (intact male). The boar is too small to be safe on pasture so I decided to keep him in the lambing jugs, which have a hog panel front, until he is larger. I duly placed him in the lambing jugs and gave him water, some goat milk and some hog feed as well as some hay. Since hogs are social and I was concerned about him maintaining his body heat at night, I decided to also put the younger and smaller gilt in with him. 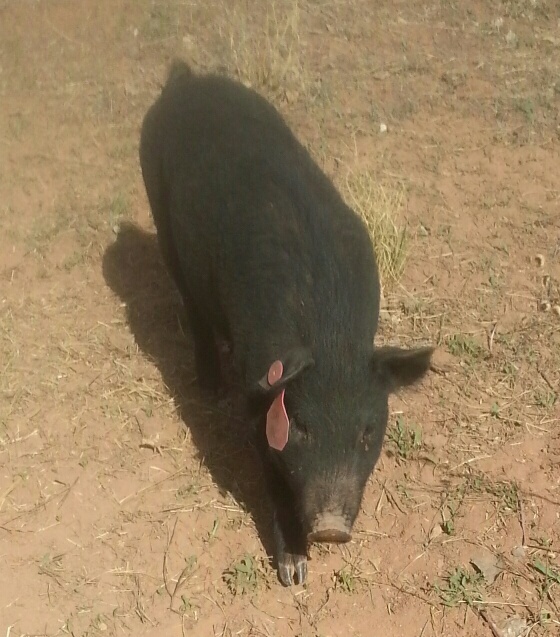 In the length of time it took me to walk to the pasture, pick up the gilt and bring her back to the animal pens, the boar had found a way out. After depositing the gilt in the new pig quarters, I started looking for the boar. I found him running around the horse corral with my horse standing stock still with a WTF expression on her face. I climbed over the corral fence and scooped him up. He escaped twice more but stayed close to the pen with the gilt and since I have no idea how he got through the hog panel, all I could do was hope that he didn’t go AWOL during the night. Since it froze last night I was doubly glad that he spent the night snuggled up to the gilt in the hay I dumped in a tub for them to use as a shelter. 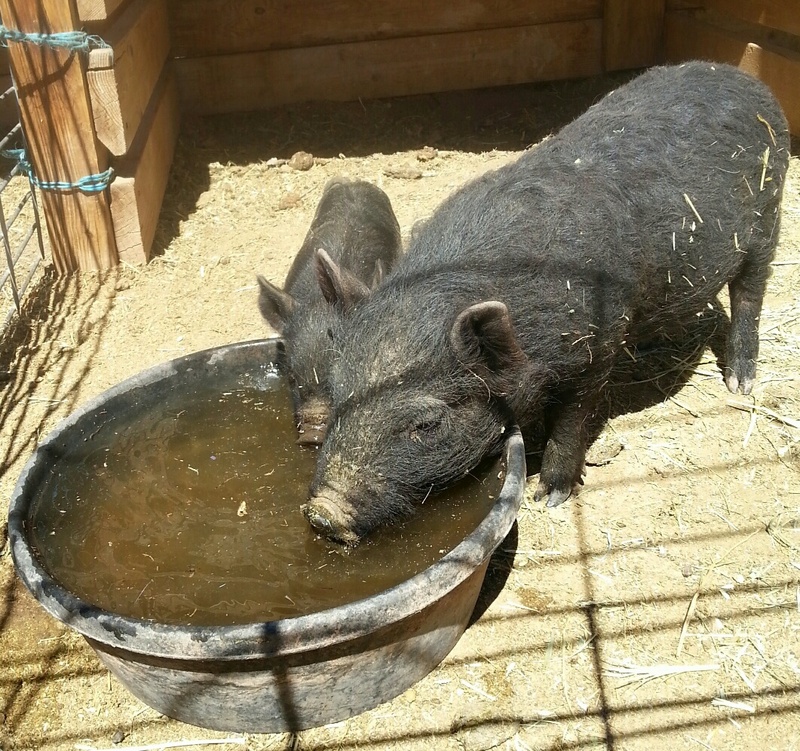 I’ll run a naming contest starting this weekend – since these are not going to the butcher (or at least not in the foreseeable future) I’m looking for non-food names. 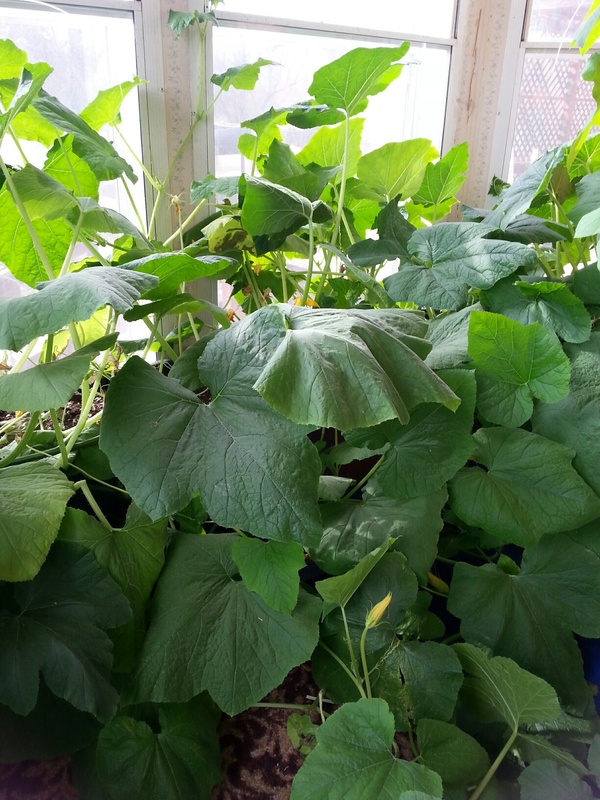 – not really, but the squash is definitely taking over the breakfast room. The breakfast room faces south and gets wonderful light which makes it ideal for growing over the winter months. 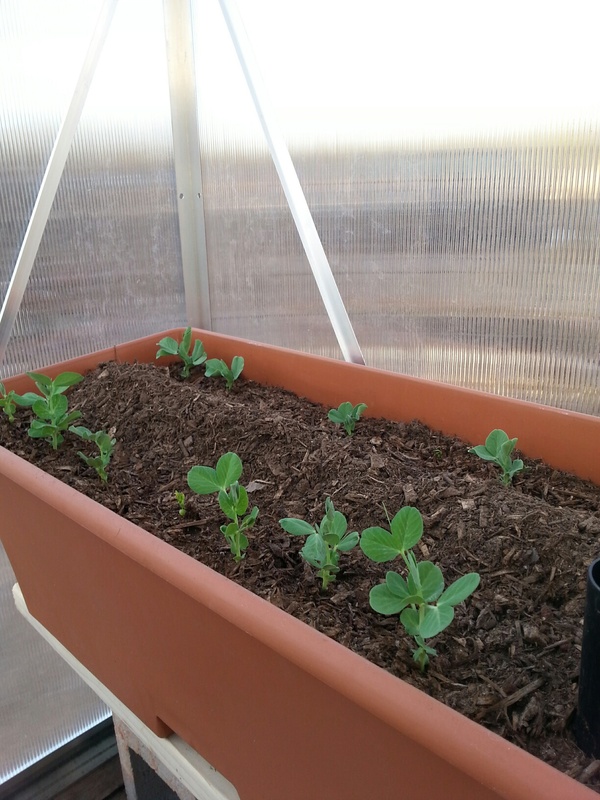 The peas I planted in an Earthbox in the Greenhouse are also doing well. 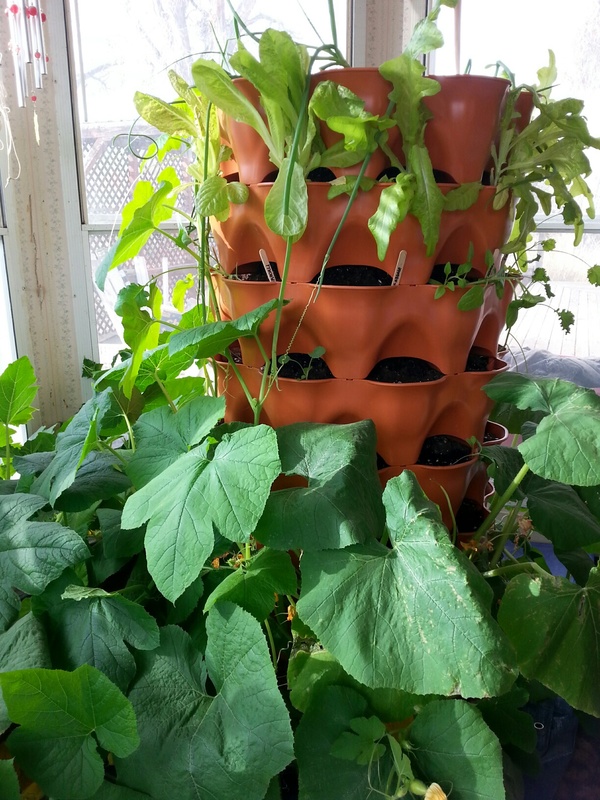 This weekend I hope to put up a string trellis for the peas. 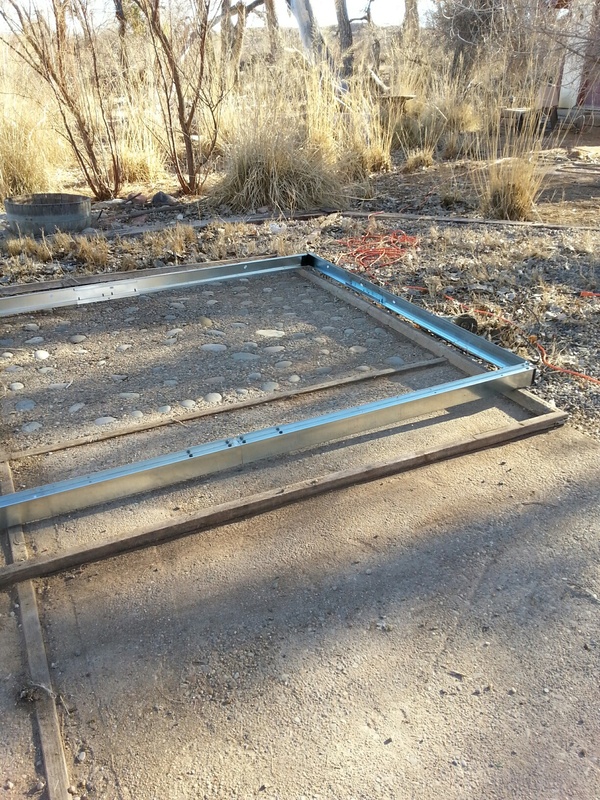 The previous owners of my place had left a metal gazebo screwed into wood strips, in turn screwed into the concrete pad. Over the years I kept telling myself I needed to take it down but never got around to it. A few months ago, I had a brilliant idea of turning the gazebo into a greenhouse. I also thought it could do double duty as an enclosed area to milk goats. The milking stand was on the deck, exposed to wind and rain, which translated into having to milk goats in the house in bad weather. 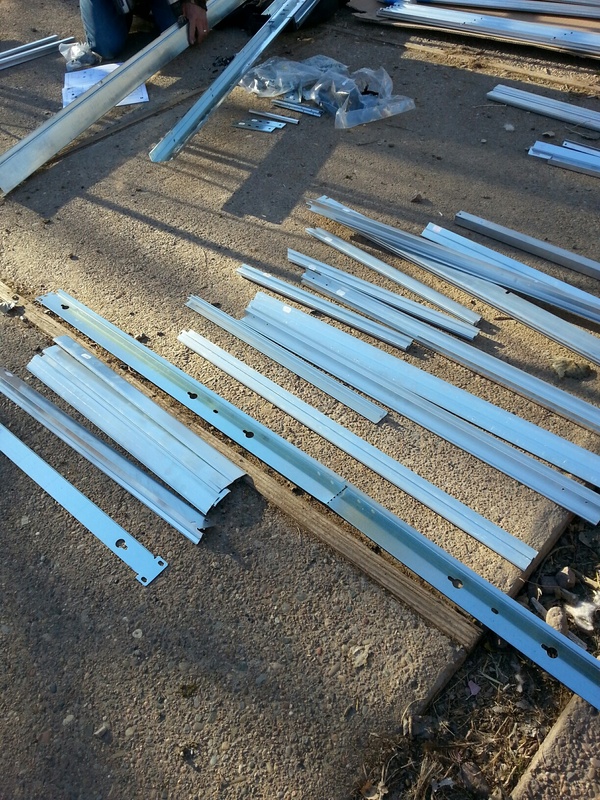 However, in pricing out the polycarbonate sheets and other materials that would be needed, I came to the conclusion that it wasn’t going to be a feasible project. 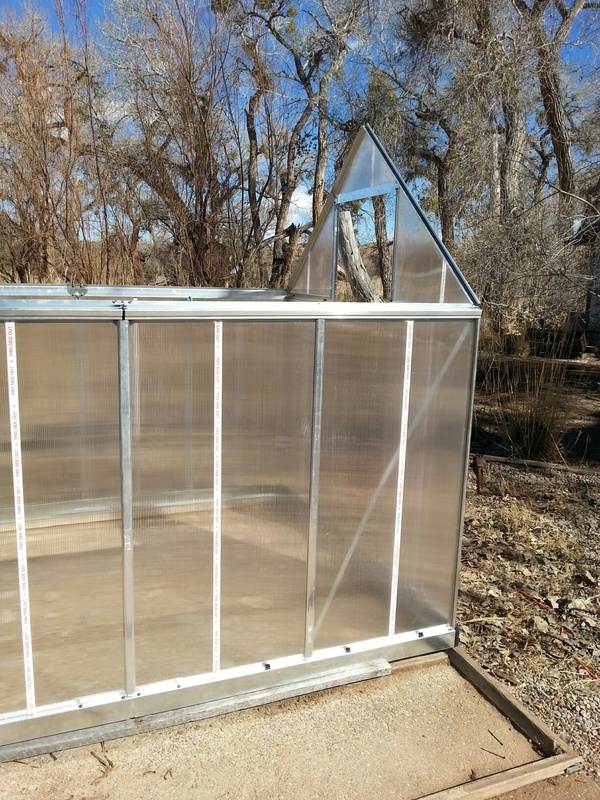 It did get me looking at pre-fab greenhouses though and I found a Palram Nature Series Mythos Hobby Greenhouse on Amazon for a couple of hundred dollars less than it was going to cost me to convert the gazebo (and the shipping was free). 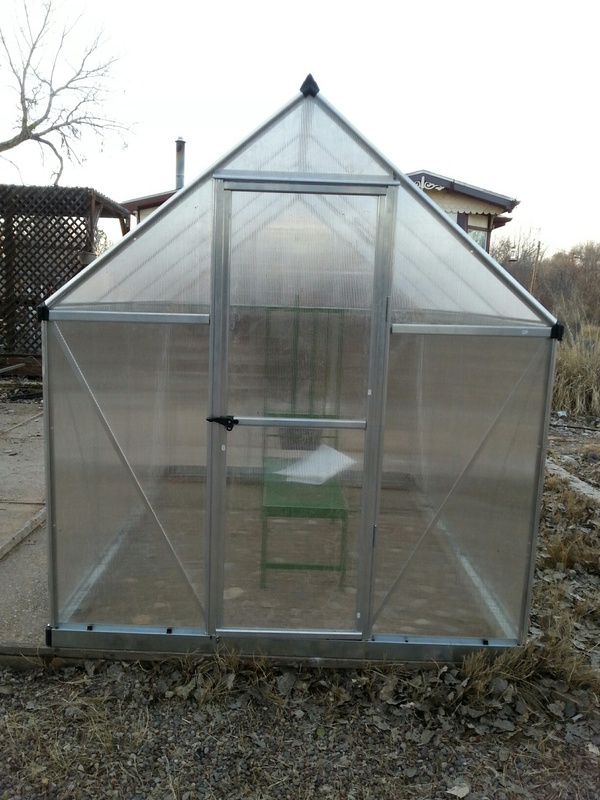 So I ordered the greenhouse and on January 29th it was delivered. 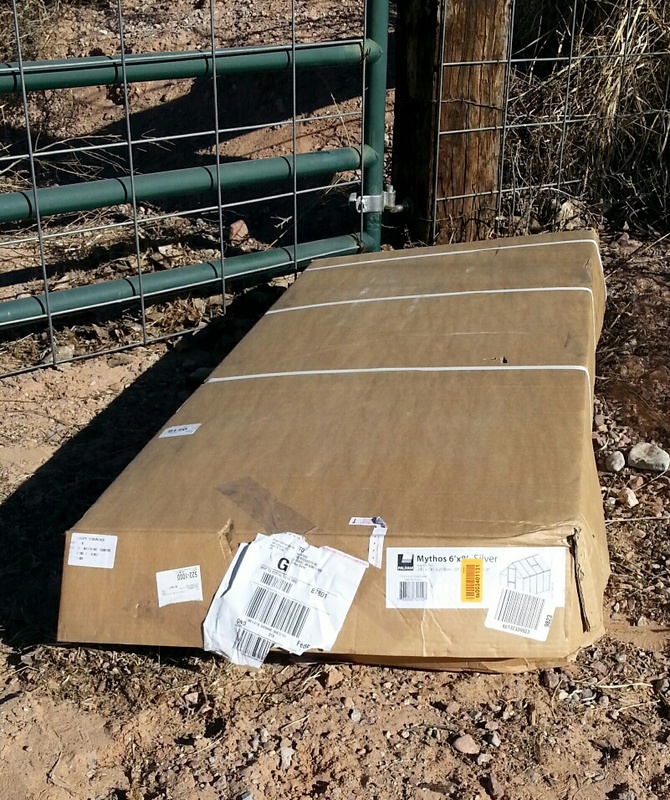 The delivery driver put it over the gate and my first two thoughts were: 1) something was going to be broken and 2) the box wasn’t nearly large enough to contain a greenhouse the size I ordered. The box was too heavy for me to lift so I unpacked it at the gate and placed each piece in the back seat of my car to transport down the drive. Amazingly, nothing appeared damaged as I unpacked the box. 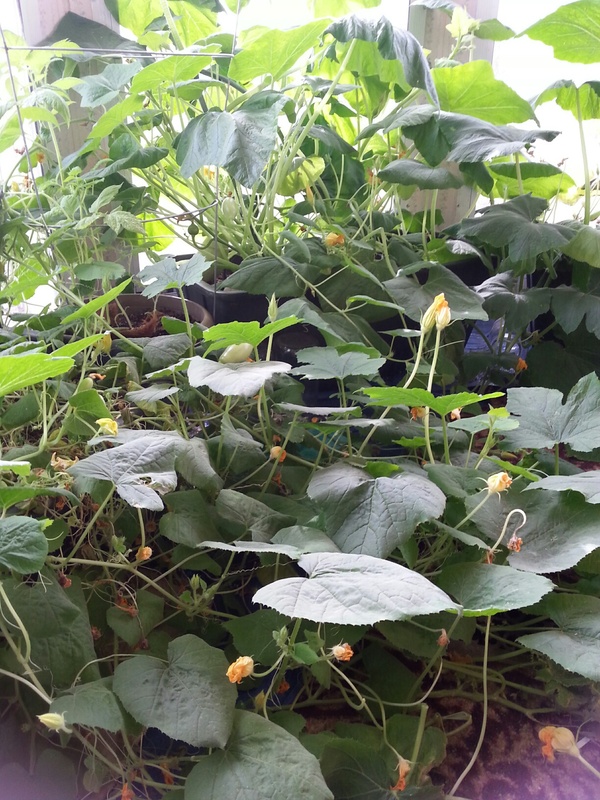 While I have no doubt that I could have (eventually) put the greenhouse up by myself, thankfully a (more skilled) friend came by on the 31st to put up the greenhouse for me. 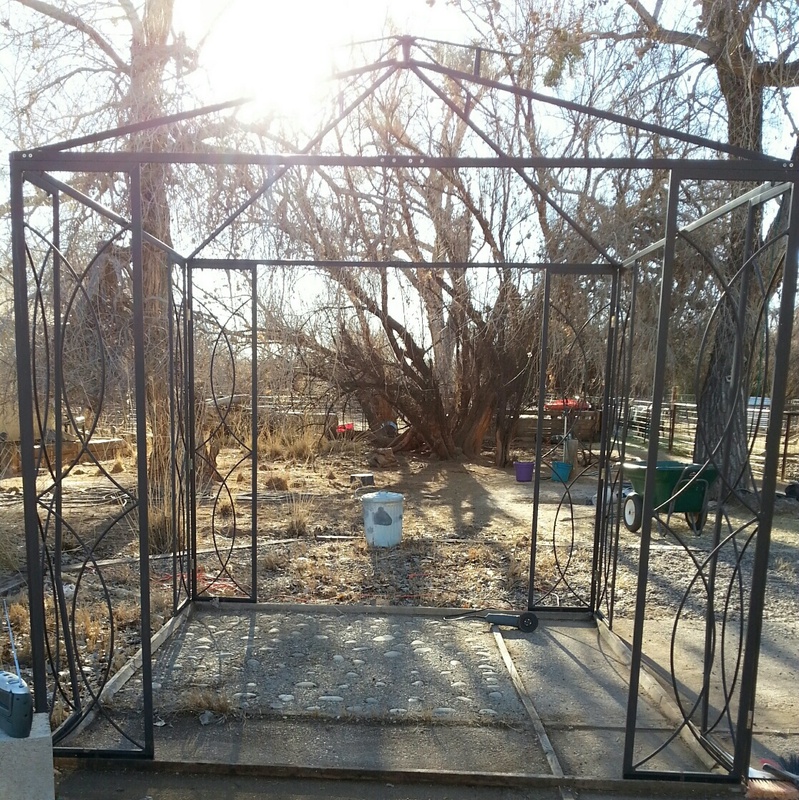 # 1 – The first order of business was to take the gazebo off the concrete pad. 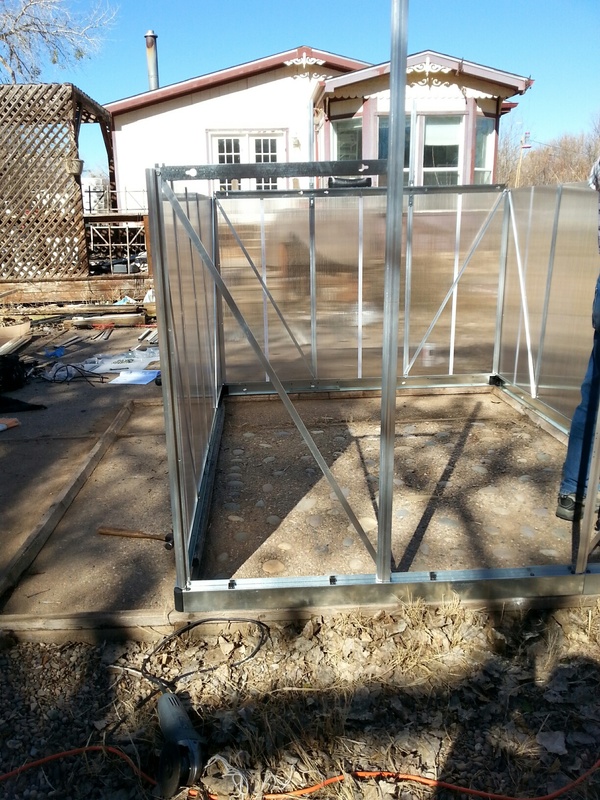 #2 – Then, each piece of the greenhouse was laid out. The instructions were simply diagrams – not my strong suit – and thankfully almost all the pieces had corresponding numbers to match the diagrams. 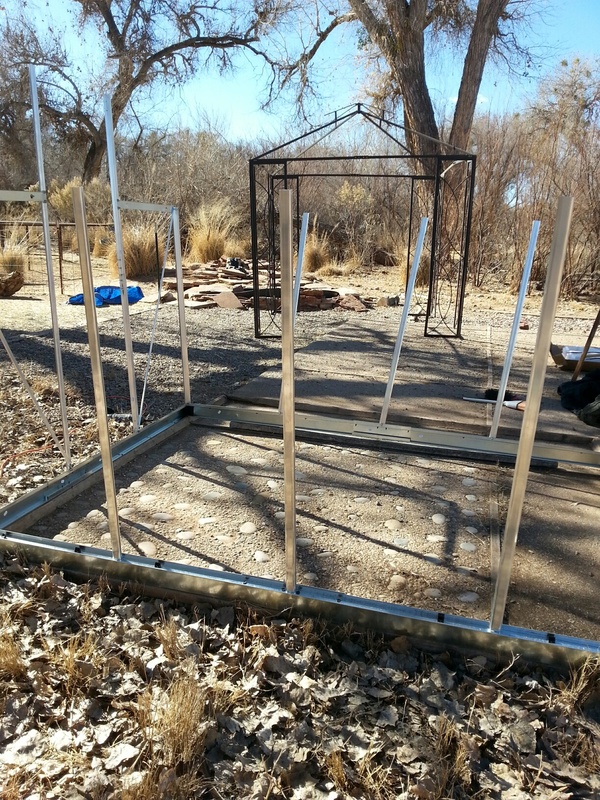 #3 – The next step was to screw the frame into the wooden strips the gazebo had been fastened to. #4 – Then the supporting framework was put up. Gradually more and more pieces were installed. In addition to the milk stand, there are now cinderblock and board benches with two earthboxes planted with peas and beets. About 2 am the next day, the winds started to howl and blow. I lay there just waiting for the crash foretelling that the greenhouse had been blown into a tree or the pumphouse. 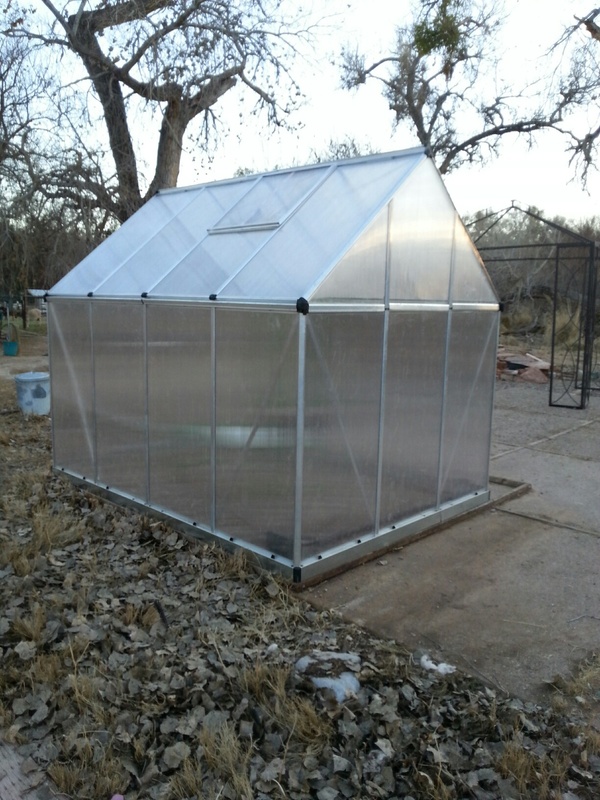 However, the wooden strips screwed into the concrete which had held the gazebo in place were also able to keep the greenhouse anchored. 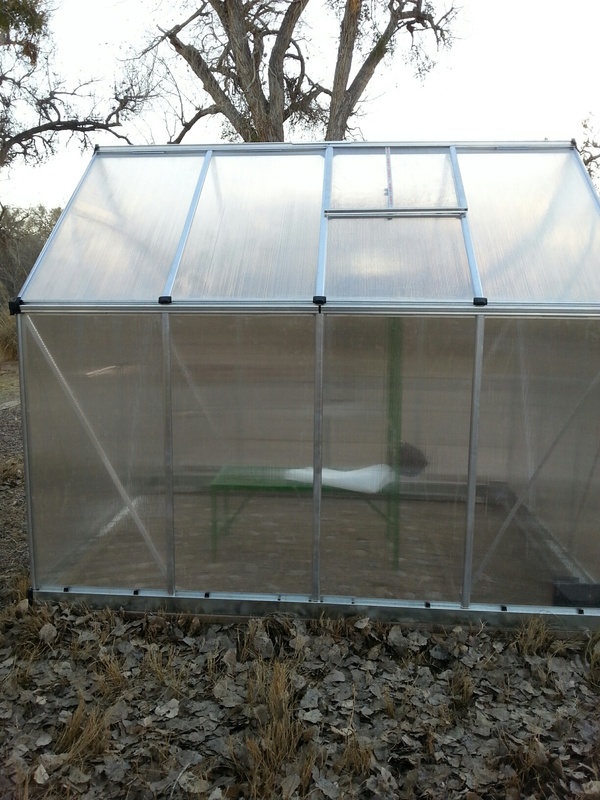 Several high winds later, the greenhouse is still anchored and I have a sheltered area to milk goats as well as a chicken proof place to grow additional vegetables. 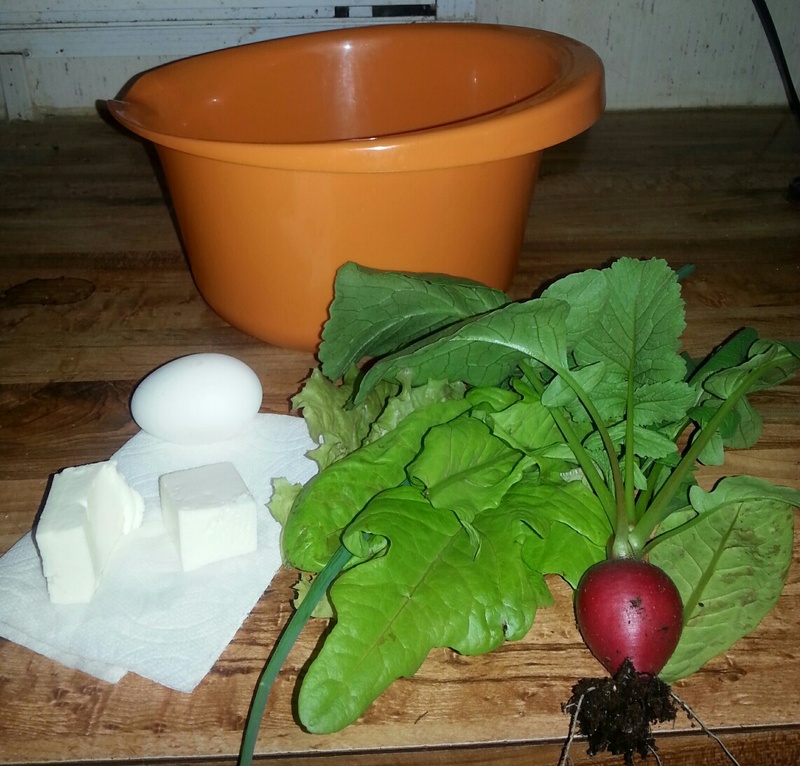 Dinner tonight included home grown lettuce, a radish and green onion (from my garden tower); feta cheese made from my goat’s milk and a hard boiled egg provided by one of my chickens.